Perhaps you have heard that certain vegetables in the nightshade family cause inflammation. But it is worthwhile to say goodbye to tomato products forever? Are nightshades bad for you? Here’s the lowdown on nightshades. Nightshades seem fundamental to our modern diet. I never really considered how tomatoes permeated my meals until a few years ago when naturopath told me to reduce nightshade consumption (and I currently avoid all nightshades to help heal my gut). Ketchup, pizza, marinara sauce, barbecue sauce… the list goes on! Potatoes are also a staple: french fries, baked potatoes, mashed potatoes and roasted potatoes. Peppers are another popular ingredient, since paprika and chili powder are in many spice blends and mexican dishes. Nightshades contain substances called alkaloids, which can cause inflammation and stress. One type of alkaloid in nightshades, Solanine, has been studied for its ability to block cholintesterase, an important enzyme in nerve cells. The ability of this alkaloid to inhibit cholintesterase often results in joint stiffness and joint pain. Another harmful substance in nightshades is calcitriol, a hormone that signals the body to update calcium from the diet. Although adequate dietary calcium supports hormones, excess calcitriol causes too much calcium in the blood. This results in calcium deposits in soft tissues, such as tendons and ligaments. Nightshades are high in lectins, a substance produced in all plants as a natural pesticide. Lectins are described as “sticky” molecules because they tend to attach to the walls of the intestine. This is exactly the reason that the Autoimmune Paleo Protocol calls for eliminating high-lectin foods like nightshades, since the action of lectins on the small intestine lining can cause or exacerbate leaky gut. Leaky gut occurs when things like undigested carbohydrates or lectins create little gaps between the cells of the small intestine, allowing undigested food particles to escape into the blood stream. There is not a one-size-fits all answer to this question, but there are a few issues that are widely exacerbated by nightshades. Additionally, some people are more sensitive to the lectin and alkaloid content of nightshades. One easy method to determine if nightshades are bad for you is this simple Food Sensitivities Test. This allows your body to communicate to you if nightshades cause a stress reaction. Choose ripe nightshades, since solanine levels are highest in unripe ones. For example, choose juicy red tomatoes over green tomatoes and red peppers over green peppers. Cook nightshades if practical, since cooking reduces alkaloid content up to 50%. Lectins are also degraded, to varying levels, with cooking. Use moderation and variety. I don’t think that anything should be eaten everyday, because that can cause the body to develop a sensitivity. So it isn’t a great choice to use tomato sauce and ketchup as a daily condiment. Enjoy variety in your meals and that will help you eat nightshades in moderation. 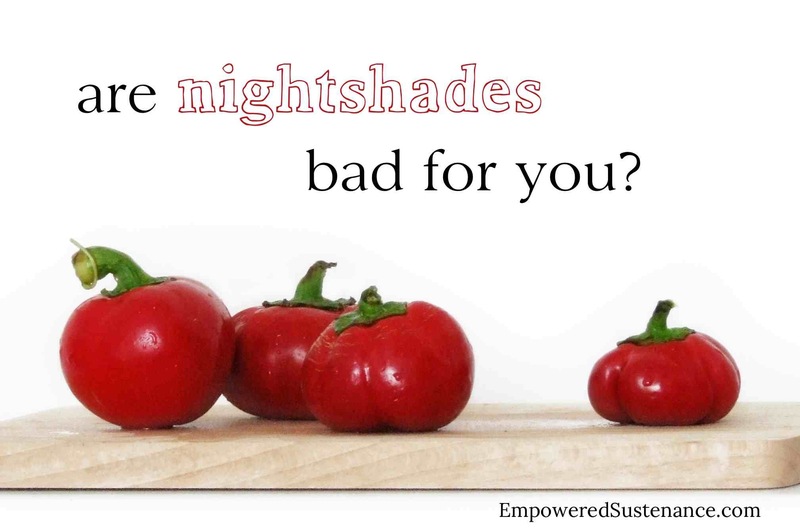 Have you reduced or eliminated nightshades from your diet? Why? I’m confused. Other sources say that tomatoes fight inflammation and help protect against platelet “stickiness”. If you are not familiar with this research, go to nutritionfacts.org and search for tomatoes – video includes references to a lot of current research. Usually very reliable site..
I’d be interested in comments from anyone as to how there can be such conflicting research and experience. Well the problem is were talking apples and oranges here. You’re talking about platelets but the problem with Nightshade plants is they have lectins pause. 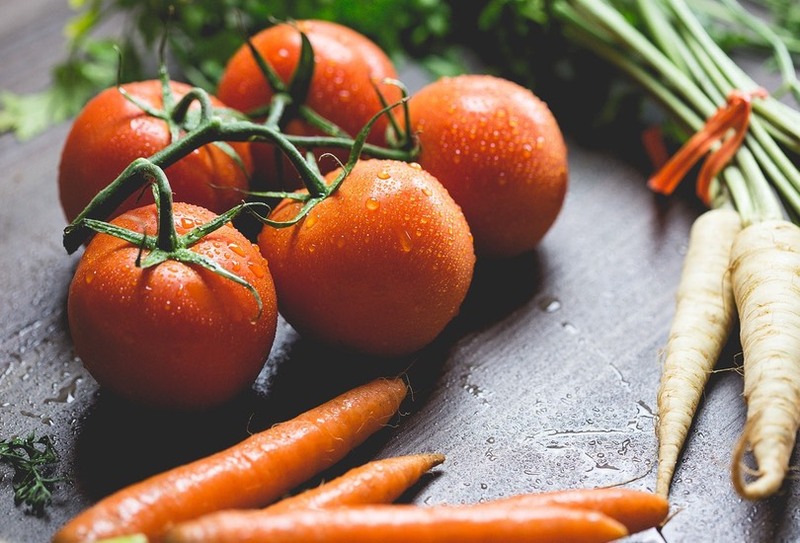 Lectins are a plants natural defense against bugs. It’s the lectins that stick to your gut and create irritable bowel syndrome leaky gut syndrome and so on. What you can do if you still want to use tomatoes and what they actually do in Italy or at least used to do… peel your tomatoes and de-seed them using just the meat of the tomato. Roma tomatoes have far fewer seeds. My mom used to actually peel tomatoes. She did it because she just liked it better. A lot of the old knowledge is lost. You surely don’t hear much about the Farmers Almanac anymore. And Industrial farming doesn’t incorporate the old knowledge. That knowledge was based on health reasons. There’s actually very interesting arguments as to biblical and other spiritual text having to do with not only spiritual knowledge but that of Health as well. What spices can I use to add heat if I am avoiding nightshades? Your recommendations are appreciated. Turmeric, sea salt which beige in color and use freshsage and Rosemary together on your pork chops. That should lead you some place. In my opinion black pepper (Piper nigrum) is better than Chili peppers. Black pepper is not of nightshade family. Great article. I have fibromyalgia (newly diagnosed) and am trying ANYTHING to feel better. I’ve heard of nightshade being in supplements and wondered—what would I need to look for on the labels so that I know it’s nightshade that I’m consuming? I take Vit D, B12, Magnesium, Calcium and a multivite. Thanks! I also have fibromyalgia and inflammation. I was riding carts in the stores where they are available. Using a cane. And my husband had to help me dress. I changed my eating habits with the help from my health and wellness coach. I no longer eat gluten, sugar, dairy and night shade vegetables. When you get rid of inflammation the fibromyalgia is much much better. Eat grains, nuts, vegetables and fruit and meats (protein). Drink almond milk, it is very good. Good luck. If you need to talk to me, let me know. I put this site on my desktop. Cut out wheat…see if you don’t improve. Consider trying a B6 supplement (supports nerve health) or even a multi-B supplement such as B50 or B100 Complex. I found that it helps me with myalgias and malaise r/t CFIDS. If I ingest a speck of potato I break out with one little bump on my face that will last a month. If I eat more than a spoonful of eggplant I get depressed. If I eat more than a small amount of peppers I become a crazy person: hysterical, raging, crying. I did not realize how badly the nightshades were effecting me until I went on a Macrobiotic diet, which is nightshade free. Easy to see the effect as I went off the diet. An Ayurvedic doctor in India gave me natural meds which allowed me to eat nightshades. However, after a while it dawned on me that if my body didn’t want nightshades, why was I tricking it into eating them. Now I just avoid them. I doubt that I am unique in my reaction to nightshades, but unless someone eliminates them, how would they know ? Did you eat green unripened foods! Interesting though? I have had bad IBS for a while. I noticed tomatoes or sauce seem to make my and my daughters problems worse. I mentioned it to my doctor and she said to avoid nightshades. I couldn’t figure out why no matter how hard I try I still have IBS. I’m going to eliminate potatoes as I’m convinced that’s the remaining culprit. Try cutting out wheat and sugar. Got rid of my IBS immediately. After 10 years of suffering I am free of it. Cook the tomatoes and peppers in an instant pot and it reduces a lot of the lectins, which is what I’m reacting to. I would cut all animal pdoducts first. Animal products? The food that causes the least allergic response? Dairy is problematic for most people, so animal products should definitely be taken into consideration when it comes to digestive issues. What’s weird is that green and red chilies are used abundantly in Thai & Indian cooking and many articles post their anti-inflammatory and immune strengthening properties. These are things science is still wrapping its (not very nimble) head around – I suspect that when cooked, and potentially when combined with other spices (cultures are essentially repositories of epigenetic knowledge – traditional recipes, be they Eastern or Western, have more benefits and age-old nutritional value than our current ‘objective’, but simplistic – e.g. macro-nutrient-based – analyses are able to tell us), some of the nightshade culprits suffer a chemical change of some sort and produce more good stuff than bad stuff – or rather the good stuff overwhelms the bad stuff, or even transforms the bad stuff into super-good-stuff. At the moment we just don’t know – we don’t even know what happens to a carrot once it gets inside your gut – which of the chemicals provide the antioxidants and so forth – they thought it was betacarotene, but then realized that, in isolation, it just doesn’t work. So my advice, as an academic and an amateur nutritional researcher, is this: do your homework, even if this means staying at home and reading books and articles for many hours (don’t do this if you’re stressed, or if it stresses you, though; breathe – consider the very simple and free Wim Hof method; it really helps, especially if you have autoimmune disorders (there’s a good vice documentary about this); trust traditional knowledge while retaining your common sense; make notes if you care, compare notes as you build up an index of sort, and keep your mind open; don’t exaggerate; don’t get discouraged. Your body can heal itself, and is more resilient than you think! So what is left to eat? I can’t eat gluten, fast foods, some red meat, grains, dairy–can i eat sand? I have high cholesterol and am currently doing everything I can to stay off Statins. My accupuncturest has recommended that I avoid nightshade veggies because they effect the liver. I can’t seem to find any articles about this. Most is just talking about inflammation and that is not my issue. Can you direct me?